My windows have been heavily oxidized and water spot stained for quite a few years and nothing I have tried over the years has made a dent in trying to reverse this. Not even "Barkeepers Friend", which is supposed to be some amazing stuff. That was until I read on the Meguiars forum about people using their Mirror Glaze Professional Ultra-Cut #4 Compound. Their Ultra Cut series of rubbing compound with it's micro-abrasiveness, is normally used to remove swirls and scratches in neglected paint without damaging the clear coat. I've seen a few before and after pictures of people using it on auto glass and figured i'd give it a try since no other methods or products have worked for me. I did a test spot a few months ago on my front passenger side window as well as one spot on my front windshield where the wipers don't travel. There's a big difference in the two test spots when compared to the surrounding glass in both areas. Those two spots still look great and nothing is coming back. Today I actually got around to finishing all the windows on the passenger side and I was able to get rid of 98%* of the oxidation. It's to the point where it is virtually unnoticeable and you cannot feel the oxidation anymore, glass is smooth as a new one and you can see a clear reflection. 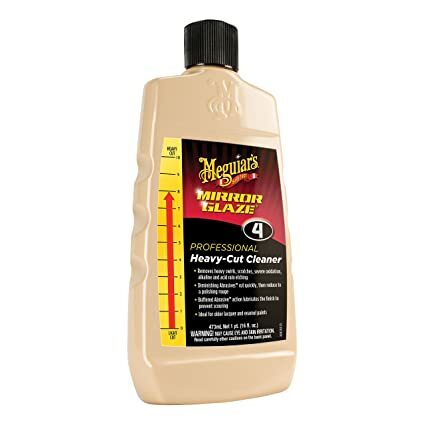 I applied this product to a wet and dry window, to see which it'll work best on. On the Meguiars forum they said to use it wet, but with this level of oxidation it wasn't working near as good as when applied dry with a damp, nearly dry microfiber cloth. In my opinion, if you have extreme window oxidation like my truck does use this product dry. I will say this though; no matter if this is applied on a wet window or a dry window there will be some micro-scratches. It's not visible inside or outside unless you are using a flashlight on the window, or you are under street lighting at night like in a parking lot for-instance and you happen to be looking out the window at the light source. I applied the compound in a swirling motion moving from the middle of the glass to the outside a few times over. Then I did the same motion again from left to right, starting from the bottom and making my way to the top. Wet the window with a separate microfiber cloth and dry with another every so often to see your progress. You'll know you're making good progress when the glass is feeling smooth. Be sure to have a bucket of water to rinse out the microfiber cloth being used to apply the compound. Keep looking at different angles when you dry the glass to see spots you missed and how many more passes of the compound you'll need to use. Don't bother using a DA or polisher in my opinion. That'll either dry up the compound too fast or sling it around if too much is applied. It's better to do this by hand honestly and it'll only take you an hour or so to finish one side of the truck.